This entry was posted on August 16, 2018 by Jessica Anderson. This blog post was requested by a customer. She couldn't find anywhere on our website how to choose the corresponding colors for First, Second and Third place. What a great topic and suggestion! When ordering awards, it's important to know the traditional colors for the places. Use the guide below for the correct colors for the US; Canada is slightly different. Neck drape and medal colors for 1st, 2nd, and 3rd places. First Place: Gold and blue are the colors that represent 1st place. Gold medals are given to the top finishers at the Olympics and this carries over to the rest of the awards world. 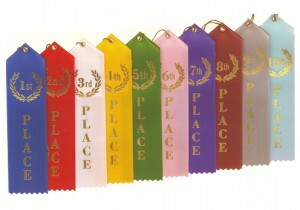 Blue ribbons, blue neck drapes, and blue column are also used to represent first place. Think of the quintessential cook off, where the top contestant gets a "Blue Ribbon"! Second Place: Silver and red symbolize 2nd place. These finishers get a silver medal, as well as red ribbons and neck drapes as a second place prize. Third Place: Bronze and white stand for 3rd place. Bronze medals are given to third place finishers along with white neck drapes and white ribbons. 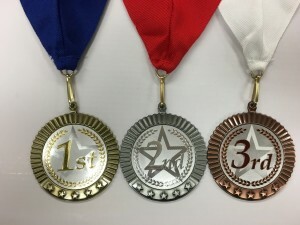 Fourth Place: There isn't a metal color for 4th place. For ribbons, it's yellow. Fifth Place: Again, no metal color for 5th place, but the ribbon color is green. I hope this helps with ordering from Trophies2Go! Feel free to let me know if you have any questions or other blog topics you'd like covered about trophies and awards by commenting below. Editor's Note: This post was originally published March 2016, It has been updated for content.